Summer equates nights out, open-air eating and BBQ’s, and what better way to make fundraising than a BBQ?! The aim behind this event was four-fold: the day-to-day running of our premises, to get more equipment in order to to spread our message, to support useful courses for our volunteers and implementing and sustaining our projects overseas. 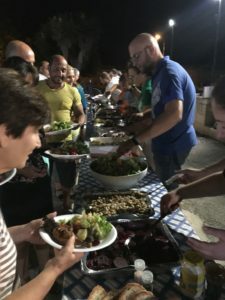 The BBQ was held at Dar Tal-Providenza in Siggiewi and consisted of two dishes (pasta and a choice of chicken or pork), salads and fresh fruit and ice-cream. Various sponsors and leading outlets gave gifts and vouchers that were drawn during the event. OMADA is kicking-off 2018 goodbye with a BANG! Agara's aim is to walk together with different communities and individuals all over the world to empower them in their respective environments.